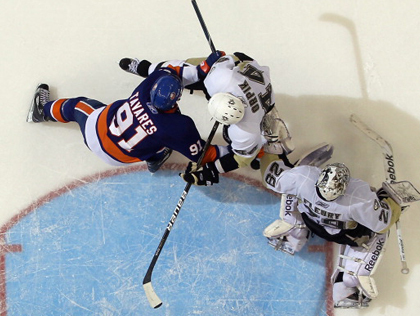 Things to look for as the Penguins take the ice against the New York Islanders. Though the Penguins regular season schedule is quickly coming to an end, they still have a very attainable goal in front of them. The Atlantic Division title, which was thought to be lost along with the last game against Philadelphia, is suddenly in reach. The Flyers have done a lead balloon impression over the past couple of weeks and sit just one point ahead of YOUR Pittsburgh Penguins. We all know how that played out so I won’t rehash it for you. However, it proved to be the most annoying couple of weeks out of the entire season. Folks on both sides of the equation spent their days and night launching salvos at one another. Islanders’ fans spent the time praising their crazies for being brave and standing up to the “Big Bad Penguins” and bashing Mario Lemieux. While Penguins’ fans spent and still spend far too much time focusing on a career minor leaguer named Trevor Gillies. That guy has never gotten more press than he has since that ill fated day in February. He probably smiles a toothy grin each time he sees a “Bury Gillies” shirt or sign, as he probably figured he would never have such impact. You guys have made him a household name…hazaa! And Isles fan… though you thought Lemieux was being hypocritical, the bashing helped his message grow legs and it walked all the way to the commissioner’s office. I am not here to waste your time railing on either side for a travesty that happened two months ago. However, I am here to give you a handful of things to look for during this evening’s game. First of all, don’t get your hopes up for a repeat of what we saw back in February. It simply will not happen. Let’s all remember the time last season when Matt Cooke’s hit on Marc Savard was supposed to set off a firestorm during the next Pens/B’s game. The result was something more akin to a match striking the side of its box, igniting and quickly burning out in the form of a less than spectacular fight between Cooke and Shawn Thornton. From there, nada. Sure the Penguins are apparently dressing both Eric Godard and Deryk Engelland, but that is more a symbolic gesture. I wouldn’t be surprised to a spat or two during the night, but nothing more than you would see in any other game. 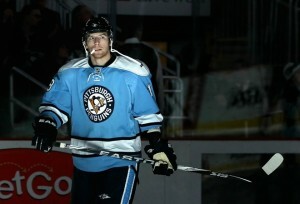 The league is watching too closely, the Penguins have too much to play for and neither team wants to pay a hefty fine. Marc Andre Fleury – the Flower taking the cage sort of shows you the Penguins’ mindset heading into this game. They are focused on winning it. MAF has a chance to help them earn two huge points on the road, thus leaving the cage to Brent Johnson on Sunday in Atlanta. As mentioned above, it seems most are focused on Gillies… not me. I will be watching a pair of 30 goal scorers – Michael Grabner and Matt Moulson. Those two have been superb this season and are the types of players that can really put the Islanders in the drivers seat if the Birds aren’t careful – especially Grabner. The kid has blinding speed, great hands and can stick-handle in a phone booth. I am marking him down for a goal and at least two shorthanded breakaways. It will also be interesting to get a look at the crowd in the barn. The Islanders have got to be loving the fact that so many Penguins fans decided to “invade” their arena. They are a cash starved team that is set to reap the benefits of a sellout. James Neal … he scores tonight. In regulation. In fact, pencil him in for the game winning goal. Home viewers keep your eyes peeled for our man Cy Clark. “Hulk Hogan Guy,” as the Penguins so aptly dubbed him, made the trek to Long Island and is sure to get a moment or two of screen time this evening. I would also count on seeing a Pensblog Charlie or ten, as the blog’s brain trust and many of their loyal readers also made the trip. Other than the above, it really is tough to find much else to look forward too in a Pens/Isles match-up. If not for the hype that this game has received for the “incident” we would be hoping for an injury free weekend and Game 1 next week.